Many different companies use aerial platforms to perform various tasks. Elliott Equipment Company’s unmatched design flexibility ensures its customers get the right tool for the job. In fact, Elliott has long been known for providing turnkey solutions to enhance their customer’s success in the field across numerous industries. Our engineers will work closely with your operation throughout the sales-build process to provide your workers a tool to be their most efficient. And, when your job site is a major highway network, efficiency is critical. Michigan Department of Transportation was in need of a customized crane to handle new installations, scheduled maintenance, repairs and/or replacements of their large overhead signs and the supporting structures. Elliott Equipment Company, backed with an industry-proven engineering team, were up for the challenge. The result was a customized 26 ton crane, with a 105 foot tip height and digger attachment. This solution allowed the DOT not only to handle heavy structures and signs, but also to dig holes up to 48” in diameter with an equipped 20,000 ft-lb hydraulic auger for setting vertical assemblies. In addition, the machine touted wireless radio remote controls, conspicuity light bar, a special air compressor for powering the crew’s tools mounted to the custom 20-foot bed to allow maximum available bed space and toolboxes for extra carrying capacity. 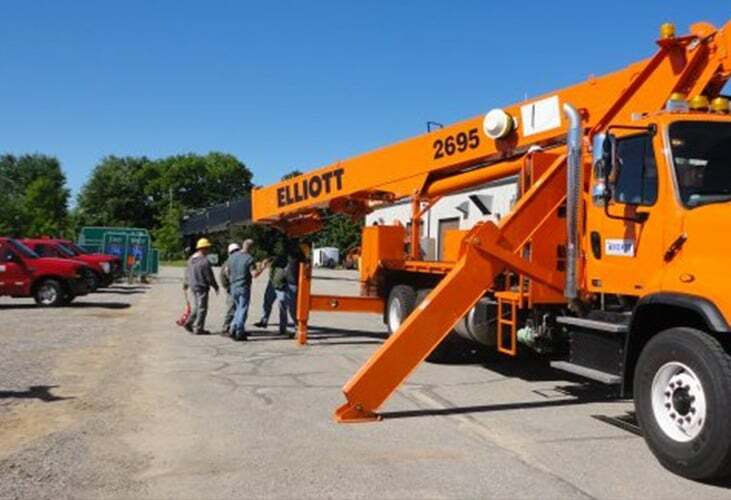 Michigan DOT was so impressed with this versatile unit, they recently added another Elliott to their fleet. The second unit is a SkyWalk material handling aerial with a 16’ long work platform which provides a three-man platform, maximum side reach while providing a compact operating envelope. To see how department of transportation and public works crews get jobs done with Elliott machines, download this industry brochure. Or, get in touch with a distributor near you to discuss the best way to get an Elliott machine in your fleet.